Judith Baines was born in 1933 and is a former primary school teacher and Deputy Head. She pioneered progressive teaching methods at Eynsham Primary in Oxfordshire with her husband George Baines from the late 1960s until the 1980s. Judith and George then worked at Bishop Grossteste College, Lincoln, a teacher training college, before their retirement to the Isle of Arran, Scotland, where Judith has continued to live since George’s death in 2009. Tell me about your first experience of school. We lived in Hornchurch and at four years old I went to a little private school in Upminster called Hill House, about which I can remember nothing at all. I only know I went for a while because of old photos of me in a uniform – brown, I think – and a little book I had made about a dragon, writing in between double lines and with illustrations. I may still have it. I must have been mornings only and not minded it. I could already read. There was a state school just round the corner from where we lived but it was much too ‘rough’ for this precious little girl! At the top of the road was a boys prep school that took girls for the first one or two years. I must have been allowed to come home for lunch as I don’t remember anything about it except that we had lessons in an ordinary front room of the house. I next remember being taught at home by my grandmother who was a primary teacher. She and Gramp had sold their boarding house in Brighton and come to live with us. My little next door neighbour from Hornchurch, Pat, was evacuated to us for a time and Nana taught us both. I can remember much more about what and how we learnt from this time. Nana was an excellent teacher. I can remember her cutting her finger slightly so that the individual pores showed up exuding minute dots of blood. She called me over and explained about the vascular system and I never forgot it. I painted butterflies on to parchment and stitched panels together to make a bedside lampshade and made a cross-stitch needle-case for mum which I still have. I was perfectly happy and soaking up knowledge at this time, especially about the natural world. Dad and I would go for walks in the lanes, fields and woods nearby and never failed to identify every tree, flower, bird and insect that we saw. Pat went home and Nana got a teaching job in a little private school in the village and I was sent to St, Hilda`s, yet another hopeless ‘Dame school’ (a small private school). I was allowed to cycle and came home to lunch. It was in an ordinary, large house again and I can only remember being in one classroom so I don`t suppose I was there for many years. It was on the first floor up a flight of stairs that had a lavatory half way up, which we were not allowed to use. The room must have been a biggish bedroom originally. I guess there must have been about 12 or so of us in the class. The only things I can remember doing was helping to make a model of some village or other and making tiny little grapes for the market out of papier mache and having to knit rectangles in any old colour to make a rabbit! This offended my artistic sense and, although Nana had taught me to knit, I certainly never finished mine! I remember singing classes in a downstairs room with Miss Tangy which I loved until one day, when we were learning “Sweet Lass of Richmond Hill”, I put up my hand and asked, in all innocence, what was a ‘lassomeat’. I honestly thought that was what I was being asked to learn: ‘This lass so neat (lassomeat) with smiles so sweet has won my right good will…etc.’ Miss Tangy just looked down her nose and said: ‘A bit silly over there!’ Don’t we always remember when we have been made to feel foolish? The only other memory I have from there was going out on to the tennis court to learn tennis, I had a new racket and I was a hopeless thrower and catcher. Because I couldn`t throw up a ball with my left hand to serve I was made to spend the whole lesson standing on the back line trying to throw up and catch the ball with my left hand only. This happened every week. Not only could I not do it, so felt a fool, but I was bored to tears and have hated any kind of PE ever since. So much for working on children`s weaknesses! I seem to remember Dad had a row about something with the Principal, Miss Hallett, and I went to a tutor, Miss Schofield, for mornings only until we moved to Hitchin so that I could go to St. Christopher`s in Letchworth where there was a Quaker head teacher. I don’t remember anything about that except the nice cycle ride over the common and being allowed to choose a picture from a book she had when I left. I chose a desert scene with lovely camels. I had it in my bedroom for ages. What was your favourite place in the school building? As you will realise, I had no favourite places in any of the above educational establishments except home, while Nana taught me! Was there a place in school where children were taken to be rewarded or to be punished? I have no recollection of these. No, I learnt to read at home and have only one memory of this. Pat and I had been playing in the garden in Hornchurch when there was a sudden huge clap of thunder. We dashed into the house and flung ourselves onto the settee and Pat, who was about 18 months older than I was, picked up The Flopsy Bunnies and began to read it to me and I can remember thinking: ‘I want to do that!’ Nothing more. I must have been four. Mum or Dad read to me every night and apparently I joined in from memory from a very early age. Were there any books in your classrooms? Did you feel safe and have a sense of belonging in school? When you trained to be a teacher, did you have any instruction in how to use classroom space and did you talk about the design of the school and of the classrooms? My Froebel training at Offley Place was excellent. Offley Place was one of the sites that the Froebel Institute at Roehampton was evacuated to during the War. We had Method with Mary Cubitt and Psychology with Edith Warr and English with Norah Sanderson, all of whom were exceptional women and real Educationalists led by Dorothy Venour, the Principal, whose opening lecture to us on Reverence for Life I never forgot. When we did observations of them teaching in local schools we saw the changes they made in the classrooms or discussed afterwards changes they would like to make. I mostly remember advice given to us when we did teaching practice with very young children – to make provision for dramatic play – shops, house, etc. and to make a cosy place for discussion and stories. DId your own schooling influence the way in which you taught? Incredibly it did! I had always loved children but would not go away from home to train for anything (Judith had a phobia of leaving home). If Edith Warr had not come to live next door to us during the week I don`t know what I would have done. We got to know her and she thought that even though I only had School Certificate, I would be accepted as a day student at Offley, which was a short bus ride from Hitchin. Sure enough I was. Because I had read about Froebel and had some idea of his philosophy, I went with a confidence that primary education could be very different for children than mine had been. I wanted any children I worked with to be happy and to have choices; to be loved and respected and treated as people. To be inspired and encouraged – everything that I had not experienced! I was lucky in the first three schools I taught in: Ashwell Primary in Hertfordshire; Bousfield Infants in London (I lived with my aunt and went home at weekends in a conscious effort to get over my fear of being away from home); and Strathmore Primary back in Hitchin. I was given a pretty free rein in all of them and earnestly sought to interest the children and to excite them about learning. What did you particularly like about working at Eynsham Primary school (a progressive Oxfordshire primary school that opened in 1967)? What can I say? When I saw George (Baines, who was to become Judith’s husband) and Wendy Thomson (the infant teacher) working together in Brize Norton Primary – a two teacher school – I felt I had come home, that everything I had always instinctively wanted for children had been made articulate and I immediately applied to work with George in the new school at Eynsham where he was to be Head Teacher. I use that term purposely! The wonder was no longer being tied to time. The building, the geography was the framework of the day. The home bays really looked and felt like a home, the specialist bays – library, teaching theatre, studio, craft kitchen, cooking bay, practical maths bay science bay were all clear and suitably equipped in terms of the type of furniture and floor coverings. The big open areas were lovely with higher ceilings than the bays which were all on a domestic scale and lovely wooden flooring. The furniture was all wooden, athough the maths tables were all covered in black formica and the wet and messy ones in white fomica. The book trollies, mobile cupboards – some with backs for displays and also to use to break up the areas as needed – and Daleks, as we called the mobile display boards, were all wooden and the furniture in the home bays and library were all Ercol. Each home bay had a rocking chair for the teacher, a divan or bunk beds in the alcove between two large built-in cupboards. There were bookshelves by the rocking chairs in the corner of the bay behind which was a door opening onto the grounds. Teachers’ desks were on the open side of the bay right by the entrance to that bays cloakroom so that, as the children came in in the mornings in their own time from 8.30 to 9.00 they usually found their teacher there with a welcome and suggestions about what needed to be fitted in or finished during the day. On the open side of the library and teaching theatre there were lovely curtains that could be pulled across. As I write this, I still think it was as perfect a building for primary children as I did then. It was beautiful and we enhanced that beauty with everything that went into it – the baskets for rulers, rubbers, etc. (we used baskets where ever containers were necessary except for paper and line guides, they kept kept better in the grey plastic trays). We also bought studio pottery and collected natural objects – these were used as starting points in exhibitions when appropriate or just as decorations in the home bays, staffroom etc. The other equal wonder was having a mixed age range. So much of our work was focused on individuals and the relationships that built up during the years were ones of mutual friendship and respect. At the end of each school year there was a review of the classes and often children were consulted as to whether they would like to be transferred to a parallel group. Sometimes we just changed them knowing it would be better for them but mostly they stayed with their teacher from 5 to 8 and again from 8 to 11. The design of the school enabled one to change into more of a facilitator than a dictator. I had always worked as individually as possible but alone in a class of 40 plus that was not easy whereas at Eynsham we worked with three other teachers and two helpers and. as many of the children quickly became self-directive and self-disciplined, it was much easier to watch for and meet individual needs. Were there things that didn’t work at Eynsham that you had to adapt or change? Yes. It was an art to remain conscious of the other teachers, where they were and what they were doing, for example, if someone was listening to reading you did not do the same at that moment. The team used to meet for a cup of tea in someone`s home bay at the end of each day to review the day and make plans for the next. This was vital. Sometimes we would plan for one of us to do a chalk and talk session in the theatre at a certain time and with a group of children from each of the bays. It might be maths – say long multiplication, or English – eg verbs and adverbs – for the older ones who were ready or phonic practice for younger ones who might benefit from that. George wanted us to have recourse to all known methods of teaching and the opportunity to use them appropriately. We didn`t have formal play times except after lunch so we would negotiate a quarter of an hour to go to the staffroom for coffee. Do you think that schools should be more like home? Yes. Like a loving, comfortable, lively, inspirational, stimulating, roomy, peaceful second home. If there’s one thing you could change in all schools, what would that be? That there is always trust in, and positive expectations of, children. Therefore the space must be arranged to enable choice. If an architect and a teacher got together to talk, what should they talk about? Children, their emotional needs and the many ways in which they learn. Have you ever been at a school, as a teacher or pupil, where trees were a feature of school life? Yes, Eynsham. The great old crack willows at the end of the field were the source of endless experience and learning, both incidental in play and on purpose when we exploited them. We planted many young trees and constantly drew the children`s attention to them at different times of the year. Trees often featured in their poems eg. The ash`s “witchy fingers”. You and George have an archive of your papers at the Institute of Education. What has been your legacy for schools? I hope people can see a happy, loving, inspirational community of people from four to seventyish wherein all were encouraged and enabled to learn and grow. Where, in spite of the apparent relaxed atmosphere, the stringency of planning and hard work and quality of the learning are apparent and the results obvious. Teaching as a way of life is joyful. Judith Baines answered my questions by email from her home on the Isle of Arran on 17th June 2015. 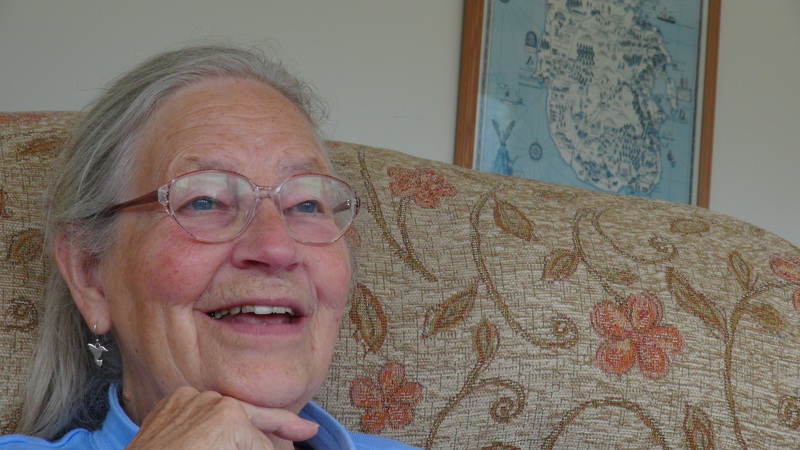 Judith Baines at home on the Isle of Arran, July 2014. Previous Interview with Ruth Benn and Rebecca Skelton, teachers at Sparrow Farm Infants & Nursery school, Feltham.